Have a delicious Independence Day! Americans have such great taste. Can be used for paper planes or missiles. Sure to be high in fiber, but using American students, tastes like old pizza and ramen. Warning: High in saturated fat. use only as directed by local Fast Food Outlet. …with a different Scratch ‘n’ Taste flavor on every sheet! 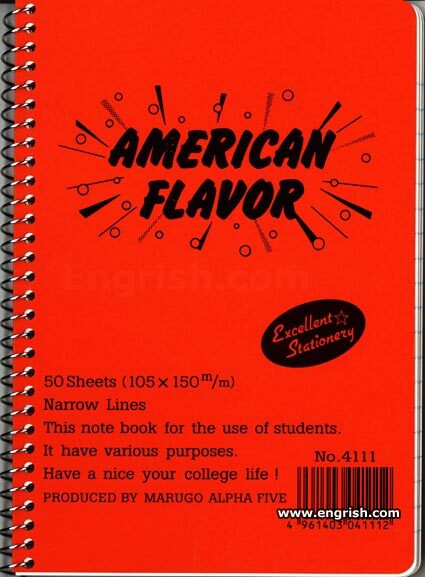 This note book for the use of Engrish.com. It have various errors. Developed by Marugo Alpha Five: Defenders of the Universe! But I’m not in college. So shouldn’t it tell me to have a nice my working life? You know, Marugo Alpha *six* exploded just months after we were left here. ‘Admiral’ Kirk never bothered to check on our progress…. An excellent source of fiber and…not much else. Hmm is it a Wide Rule sheet? American flavor: dumbed down shcool supply’s for you’re American pubic shcool experiance!one. Your illitirite and prowd! They have flavors without pulp. There’s nothing there. I wonder if Zordon helped make this? I will have a nice my college life! THANKING YOU MUCH! Hmmm… Smells like teen spirit! Have a nice your college life because college I not have! Marugo Alpha Five, come in please… Marugo Alpha Five, traffic oh-one-niner, 2 kilometers and closing, how copy? You don’t want to taste what MaruMaru Beta Five made. 105 x 150mm is the new snack size. Regular 210 x298mm meal size also available. Well, we have “Italian seasoning” and such here, so I guess it’s fair. Have a happy your Independent Day! Give me your tired, your poor, Your huddled masses yearning for flavoring. Charlie! Japan isn’t looking for Americans with good taste! They’re looking for Americans that taste good! Sir, my dog ate my homework and I will have a hot dog for dinner. Here you are 007. Memorize this message then eat it. Pages coated with Sodium Cyanide. Ta ta.